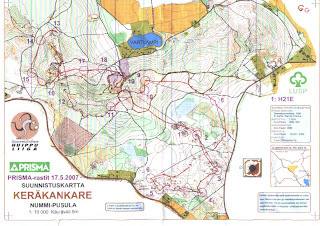 Last week I was in Finland for the start of the World Cup 2007 and for Jukola, the biggest competition in the world. The all new sparkly fantastic amazing 2007 World Cup opening premiere proved to be a big flop. 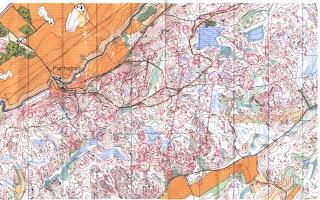 The orienteering was ok, but there was nothing special about using the Jukola assembly area if there isn't go to be anyone there... 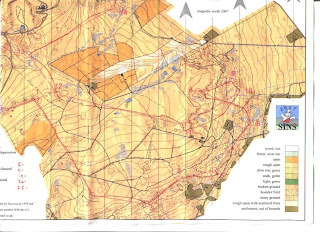 It also seemed like more time had gone into making the race seem professional etc rather than to the maps. 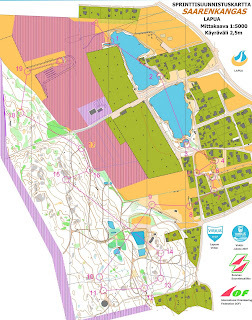 In the final there were 2 occasions when the men's and women's controls were less than 30m apart - firstly why bother? why not just use the same controls? - and secondly, when it is that fact that decides who wins the race (as it probably did in this case), surely that is not a fair and desirable situation. Anyway, I enjoyed the races themselves - the qualifier was tricky to start with, then flat out running round the hospital grounds. 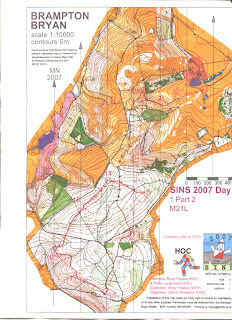 The final was the opposite, with some flat fast running to start with, then into the more technical forest. I made a route choice error to the 2nd control, but apart from that I had a good first part to the race. I caught sight of Smola (my minute man) entering the forest, and caught him around number 11 despite a small miss at number 10 (which was later revealed to be in the wrong place - more great organisation...). He lead me into a couple of controls, then I passed him on the long leg up the hill. I was running pretty well, but the last control in the forest looked pretty tricky, and I attempted to read everything very carefully. I thought I was, and then suddenly I saw a control off to my left. It looked good and had a TV camera beside it, so I obviously thought it was correct ... but the code was wrong. After scratching my head for a few seconds and working out where I was, I managed to find my control and catch Smola again on the line. I lost around 15 seconds there. I finished 11th, which is my best World Cup result (excluding World Champs last year), and so I was pretty happy, but slightly pissed off at the same time. This was the race I had been looking forward to for a long time - excited to be in a really strong team, but also really nervous to be racing at the front end of such a big competition with such a lot of pressure and expectation. 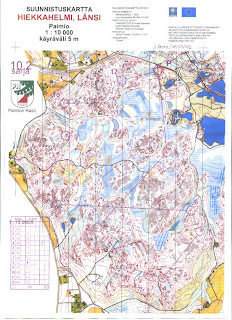 I ran first for IFK Lidingö, my first really big competition since joining. We watched the girls finish 12th and 19th, and so there was that little extra competitive pressure to do better than that. So then about 11pm I lined up with 1300 other hopefuls, waiting to get into the forest. 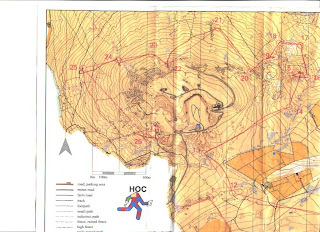 I had run first legs at World Cup relays, Nordic relays and domestically, but never in such a big field, and I had heard horror stories about mad dashes to the first control, and getting stuck behind seemingly thousands of people rushing about. When the bell went, it seemed like within a second I was already being overtaken by everybody, and I concentrated on just running as hard as possible. I managed to take a few glances of the map, but nowhere near enough to see anything useful. 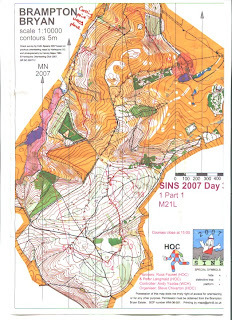 When we all hit the track, I could relax, read the map and also pass a lot of runners. I picked a really good line, and navigated really well to my gaffle, and managed to punch first. Then there was a really long leg to the second control. I ran that pretty well, and in front of the huge pack and got there first again. Then suddenly there were hundreds of people on other gaffles around, and I made a small miss to the 3rd. After that I was never at the front, but I was running around people I knew to be fairly good, and I knew that I couldn't be too far behind the leaders. I ran fairly well through the next part of the course, but then I made small mistakes at 9(+30 secs) and 10 (+1min) (lots of people did). Both times I relocated quickly and found the control without any problem. Then at 14 I ran to the wrong gaffle (+1min). After that I had almost a perfect race, no real time loss, and managed to claw back about a minute to the leaders ( 1.53 behind at 19, 0.50 behind at finish). So I finished 50 seconds behind the leaders in 5th place, and managed to just beat my old friend and rival Anders Tiltnes into 6th place ;). I was satisfied with the result, and in general with the performance, but I still made a few mistakes that I should not have made. Anyway, after I ran, my team held on to a top 10 spot all the way through, and Emil Lauri went from 7th to 4th on last leg, and almost snatched 3rd right at the end. This result is definitely my best ever club result, and one of my greatest achievements. 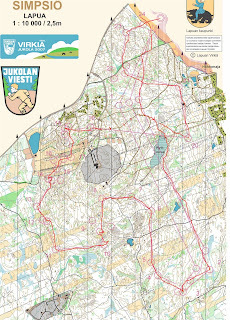 IFK Lidingö 4th at Jukola! I ran 1st leg and came back in 5th place, around 50 seconds behind. 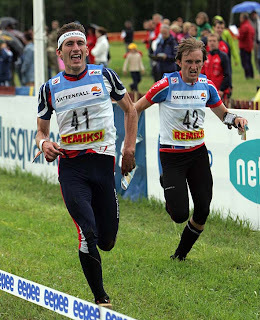 All the boys did an ok job and then this guy was the star of Jukola 2007, running the fastest leg time on last leg by 2 minutes! (including Thierry and many World Champs medallists). Yesterday my mum took part in the Race for Life in Guildford. It was her first ever race and she completed the 5km in about 35 minutes. Considering that a year ago, she couldn't run for more than 30 seconds this a massive achievement. My aunt died of cancer just over a year ago, and this was the stimulus for my mum to not only raise some money for cancer research, but also to try and improve her own health. She decided that she wanted to start running (my dad also orienteers every week), and so with my help, she started training to run this 5km. She had not done any running for around 30 years, keeping relatively active playing badminton and swimming most weeks, but not really doing large amounts of exercise. She also has arthritis in several joints restricting some of her movement, so we started small, with her running twice a week up to about 10 - 15 minutes as she was able, then as she gradually improved, she started running more often and for longer, until recently when she has been able to run for almost an hour without stopping. The goal was to complete the 5km in under 40 minutes, keeping moving the whole time. She actually did much better, getting around 35 minutes even in the warm and humid conditions. She was so enthused by the experience that she is already talking about her next (longer) race, and she even came orienteering today for the first time in many years! After a few days back at home, working and resting (and coming 2nd in a fell race - results here), I took part in a fairly local 3 day competition. It was far enough away that I camped with some friends rather than driving every day though, and unfotunately the weather was awful. There weren't a lot of elite runners at the competition, but there were a couple of former / current GB runners and over 1000 people in total. Day 1 was a completely open hillside, mostly covered with heather and bracken, but with some really bushy areas. The course was a little trickier than expected, and everybody made mistakes. I missed about 2 minutes at the 15th control, but ran quite well apart from that to win by a couple of minutes. Day 2 was very cold, wet and windy. Luckily it was in a forest, but it was a long way to the start and back from the finish. The planner must have had reasons, but I don't see why the start couldn't have been much closer and the finish actually in the assembly area. The forest was really steep, and there were some good route choices, although the forest was a bit featureless. I didn't have a great run, with small mistakes at 8 and 15 looking for platforms on slopes. I missed 5 slightly and came out of 12 the wrong direction. My route choice to 14 was also a bit dodgy. The worst thing was leaving number 8, I got stuck in a pile of broken branches which had been covered by moss and nettles. I tried to climb over and fell through to get stuck up to my waist. It took me about a minute to climb free and then go around. I finished second to Mike Sprot who seems to be running pretty well in the build up to his GB debut in Finland in a couple of weeks. Day 3 was my favourite area of the weekend. 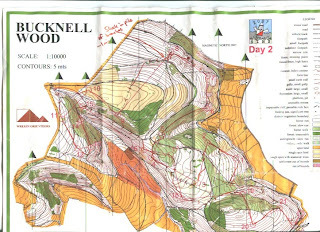 I thought both the terrain and the course were the most enjoyable and challenging, despite some brambles in places. There were some really good route choice legs, although I felt that both control 13 and 20 could have been placed slightly better to make the route choice even better. I lost 1 minute at the first control as I couldn't understand the change in vegetation, but after that I was almost perfect and won almost all the splits. I had my cleanest run and felt best in my running, especially on the hills. A really enjoyable weekend despite the weather, and there were even some fun and games at the campsite including a 3 legged score event (I came 2nd). See the video on youtube here. I travelled to Finland on the ferry with about 20 other Lidingö runners for a training camp in southern Finland (near Paimio). 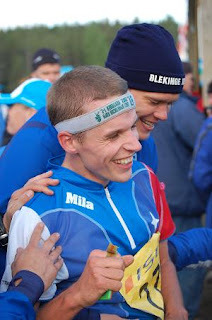 We took part in a Finnish elite race (about 2 hours after getting off the ferry). I had a pretty good race, finishing just under 3 minutes behind. I felt really tired on the climbs, and I made small mistakes at control 4 and 16. I also missed the best route to 11. We also did a couple of trainings with MS Parma. Below are a couple of training maps.